Our dogs need to engage in physical activity every day, and as such, leaving them roaming around the yard can be a good idea to give them the exercise they need. However, the problem is that they might tend to wander too far from our yards, especially if we aren’t there to monitor them. This is actually a common dilemma faced by a lot of dog owners, especially for beginners. Fortunately, this can be resolved by using an invisible dog fence. With the help of the best invisible dog fence, you’ll be able to limit the roaming space of your dog without restricting his movements. That said, what’s the best invisible dog fence you can find in the market? Before we answer that question, let us first get to know what an invisible dog fence is, how it works, and a few other FAQs. Why Use an Invisible Dog Fence? An invisible dog fence isn’t really necessary; however, if your dog has a tendency to roam around, then it could be a really useful tool. Just like dog bark collars, an invisible fence enforces some sort of disciplinary action on your dog, except that this time, it’s boundary related than behavioral. Additionally, an invisible fence is an excellent solution if your dog is a leaper since he won’t be able to jump over or avoid it. However, just like an ordinary fence, an invisible dog fence won’t prohibit entry of other critters. After all, a special collar which is pretty much like dog training collars is attached to your dog’s neck and acts like a trigger. One of the best parts about this type of the fence is that it doesn’t cost as much as a regular fence. Moreover, the best wireless invisible dog fence won’t even require any maintenance whatsoever. You don’t have to repair, replace, or repaint it, making it really convenient and money-saving. Since invisible fences don’t require any physical barrier, it can be more convenient and flexible than your typical wooden fence. You can easily “install” the fence wherever you want, which simply means that you’re not limited to your own yard. The thing with traditional fences is that they’ll take up space and will often obstruct the view of your garden. However, invisible fences eliminated this issue since they’re either wireless or buried underground. This creates an invisible barrier which can only be noticed by your dog, thus allowing you an even better view of your yard. How Invisible Dog Fences Work? An invisible fence system works with the use of a wireless signal spectrum. This spectrum uses information which is exchanged by the receiver and transmitter in the collar, thereby putting range restrictions on your dog. That said, your pet can have a certain range of free movement which is dependent on the power of the transmitter which, in turn, determines its operating range. The moment the signal breaks off between the transmitter and collar, your dog will then receive a slight shock or other stimulating signals similar to that of dog bark collars. A wireless invisible dog fence is made of two components: a collar which produces an electric shock which is triggered when your dog crosses the “fenced” area, and a transmitter. On average, this type of fence can only cover a few acres. Aside from that, there might also be cases when the transmitter can fail if there is interference with the straight line contact that connects the collar and the transmitter. On the other hand, an in-ground fence shares the same basic principle: your dog will receive a stimulation each time he crosses the unseen barrier. However, this time, the barrier will operate with the use of an underground wire. Once your dog gets too close to the wire, it will produce an alarm which is then followed by stimulation. Now, if we are to compare between the two, we could say that the wireless variant is the most convenient and easiest to use. After all, it uses a transmitter and allows a certain movement range for your dog. However, the problem is that it’s a bit more difficult to properly “fine-tune”, not to mention it’s not the best option if you want to prevent your dog from getting to a specific area like a pond or perhaps a garden. Meanwhile, if you don’t have any specific areas you’re worried your dog may go to, then it could be a good option. That said, the overall convenience that a wireless invisible dog fence offers can easily outweigh those drawbacks. In-ground variants are actually harder to install. The advantage is that they allow a great level of customization. For example, if your yard has an irregular shape, or you want your dog to avoid a certain area, they’re actually a really good option. They’re also more stable. The problem is that you’ll have to bury the fence to install it, and repairing or replacing them could be quite troublesome. Therefore, if you’re after convenience and portability, wireless types are for you. If you want to prevent access to a specific area in your yard, then in-ground types are the better choice. Before you even decide on the fence you’re going to buy, you have to make sure you consider the size of your dog first. Depending on how big or small your dog is, you need to make sure he gets enough freedom of movement around your yard. Therefore, the size of your dog is an important factor when choosing between an in-ground or wireless fence. The idea is that smaller dogs will require less space while bigger ones require more to keep themselves healthy at all times. It is, therefore, important that you give your dogs enough room to make them feel like they’re inside one spacious living space. For smaller dogs, you’d do well with a wireless fence while larger dogs would often require an in-ground system, although there are some certain instances. Your yard’s size is yet another important consideration when looking for an invisible dog fence. If you prefer more customization options, then the in-ground type is perfect. Meanwhile, if you don’t really mind about the shape of your yard, then the wireless option could be better. Also, a smaller yard is best suited for wireless systems while larger open space areas would do well with in-ground systems. Most invisible dog fence manufacturers will specify a recommended minimum weight required for your dog to use the fence. This will make sure that the electric shock won’t be too much for your little pet. The PIF00 wireless fence from PetSafe is an excellent fence system which can cover a maximum of 0.8 acres. It’s very lightweight for easy portability, comes with five different correction levels, and a waterproof design. One of the best features of the PIF000 wireless fence is that you can easily extend its overall range with the help of additional transmitters. Aside from that, you can even use it on an unlimited number of dogs. This wireless fencing system from PetControlHQ is yet another reliable and high-quality system. It comes with around 500-ft of heavy-duty wire so you can customize it however you want. Meanwhile, its collar features 10 vibration correction levels and 3 static correction levels. Unfortunately, there is no information about its total coverage areas. However, you can actually extend its range to up to 10 acres, making it a really excellent choice for a wireless invisible dog fence. Yet another high-quality product from PetSafe, the Wireless Fence Pet Containment System is actually a proven and tested product which has been in the market for over a decade already. It can cover a maximum of 0.5 acres and comes with an adjustable diameter ranging from 40 to 180 feet. Additionally, this is the ideal solution for dogs aged 6 months and above and weigh at least 8 pounds. Moreover, it uses batteries which could last somewhere around 2-3 months. Lastly, it comes with 5 different static correction levels and one tone-only level. 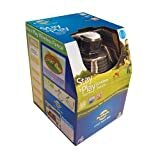 The third PetSafe product on this list, the PIF-300 containment system is a reliable and tested system which is good at what it’s doing. 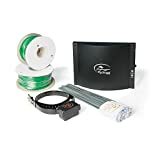 Although it’s a bit worse than its successor, not to mention it’s got a slightly higher price tag, the PIF-300 is still without a doubt an excellent choice for a wireless fence system. Perhaps one thing that makes it ideal is that it’s really quick and easy to set up. You simply have to plug it in, adjust its radius level, and everything’s good to go. Due to that, it’s ideal for customers who want to go on camping trips. This in-ground fence from SportDOG is a feature-packed product you’ll surely love. First, it comes with a 1000 ft. boundary wire which is more than enough to provide coverage of around 1.3 acres. Second, it has a waterproof collar receiver which features 4 different static correction levels aside from the tone and vibration modes. Third, it’s got a very long lasting receiver battery which could last for up to 12 months with a minimum of 6 months. The YardMax is a pretty decent containment system which can be used for both cats and dogs. With a coverage of up to 1/3 of an acre, this system can offer significant freedom of movement for your pets. Although its coverage is a bit smaller compared to the other products, it’s nonetheless a quality product which gets the job done. Also, it can be expanded up to 10 acres, making it not so limiting at all. If you look for electric dog fences on the market, you’ll mostly find those with a Gauge 20 wiring. Meanwhile, the Extreme Dog Fence comes with Gauge 14 wires, making for a safer electrical pathway designed for the system to work. Aside from that, its transmitter comes with a number of amazing features and can cover a total of 10 acres. You can also customize it very easily. 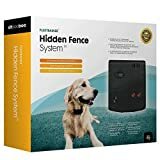 Another in-ground fence from PetSafe, this one is an entry-level system which is actually a lot more affordable compared to the other newer models. However, it’s actually an excellent product which comes with a number of amazing features. For example, it allows full customization so you can adjust it according to your preferences. Aside from that, it can cover up to 1/3 of an acre. However, if that’s too small for you, you can just expand it up to five acres with the help of extra wires and flags. The Sit Boo-Boo in-ground fence is an advanced fencing system that comes with a number of amazing features. The collar comes with a safety auto-off feature which automatically turns off the collar 10 seconds after your dog has received a correction. This feature can help prevent your dog from panicking in the event he can’t get back or are stuck within the correction zone. There are different correction modes including static, loud beep, and vibration to prevent your dog from wandering on and beyond the warning zone. Also, it includes a one-year replacement warranty, making it a really worthwhile product to buy. Q: Does invisible fence hurt my dog? A: According to experts, the static stimulation that’s produced from an invisible dog fence is relatively safe. However, we can’t really tell if our dog gets hurt every time he receives a correction. That said, there could also be instances of tissue injury on the area where the stimulation is delivered. So to answer your question, the most ideal thing would be to try the static stimulation on yourself. If you feel a bit of discomfort after getting shocked, then chances are it could hurt your dog as well. Q: What is the best wire size? A: For an invisible dog fence, the thicker its wire, the harder and more durable it will be, thereby resisting breakage. Typically, most of the wires you can find on the market are 20 Gauge wires. However, you can also find 16 Gauge, 14 Gauge, and so on. The resilience of the wire will depend on its number. The lower it is, the more durable it will be. That said, the size of the wire you have to buy will depend on the behavior of your dog. If your dog is an aggressive digger, then going for a wire which is more durable is ideal. Meanwhile, if your dog is more of a chewer, then a lower gauged wire would be more preferable. Q: Can I place the wire above the ground? A: Generally, in-ground fences are called in-ground for a reason. However, there are some manufacturers which offer systems that allow the writing to be placed above ground rather than under it. Unfortunately, it can lead to a number of issues. For example, your dog might easily spot the wire and chew on it. The wiring could also get cut by a lawnmower or might cause possible accidents such as tripping. Also, having visible wires around your yard would be quite unsightly. Q: How to install an invisible dog fence? A: Although you can seek professional help for installing an invisible dog fence, it’s actually a really easy process which you can do by yourself. To install it, you just have to prepare a few digging tools. Each state will have its own details and guidelines when it comes to buried utility lines in your property. Before you even start the DIY installation process, make sure to access this service first. After that, the next step is to make a sketch of your yard and create a layout for your invisible fence. Make sure you include the spots where your buried utility cables will be located. Pick a dry indoor location for your transmitter. This could either be in a garage or somewhere which is not often access by other people. Determine the total measurement of the wire you need for your fence. You can do this with the help of a tape measure. To be safe, make sure you purchase around 20% more wire than you’d actually need. Lay out your wires then connect them to the transmitter. However, don’t bury them just yet. Just set them on the ground first then run their ends to where your transmitter is located. If need be, you might have to drill holes in the siding so you can run your wires indoors. After that, strip around 3/4 inch of insulation on your wires then connect them to the transmitter’s terminals. Once it’s done, simply plug in your transmitter to a GFCI wall outlet. It’d be best to walk around the perimeter of your fence along with the dog collar so you can assess if it can trigger a signal or not. Head inside your house then ensure that you won’t get any signal when you’re indoors. If you do, then it’d be a good idea to move your wires away from your house. After everything’s done, it’s time to bury the wires. You can use a spade or any of your digging tools to create a 2-inch deep trench where your fence wire is. Bury the wire into the trench afterward, then fill it with the soil you just dug. When the wires are properly buried, the last step would be to train your dog. Most fence systems will come with small flags for this purpose. You can also attach a dog leash to the collar and guide your dog through the perimeter of your fence. It may take a bit of time, but once your dog gets used to the stimulation, he’ll eventually learn to associate it with restriction. There’s been more and more dog owners who are invisible dog fences on their yard. If your dog has a tendency to roam around your yard, chances are he’ll go beyond that as well. Fortunately, with the help of the best invisible dog fence, you can easily prevent such thing from happening.